M/V Walter J. McCarthy Jr. Originally built as the M/V Belle River, the vessel was renamed in 1990 to honor the former Chairman of the Detroit Edison Company, Walter J. McCarthy Jr. 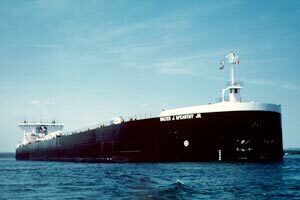 The M/V Walter J. McCarthy Jr. was built by Bay Shipbuilding Corp at Sturgeon Bay, WI and entered service in 1977. The M/V Walter J. McCarthy Jr. is powered by four 3500 HP General Motors Electro Motive Division (EMD) diesel engines. The vessel uses a conveyor system below its cargo holds to transport cargo to a "loop conveyor" system that elevates the cargo to the massive deck-mounted boom conveyor. For maneuvering in port, the vessel is equipped with 1,500 HP bow and stern thrusters. The M/V Walter J. McCarthy Jr. transports low-sulfur western coal from Superior, Wisconsin to Detroit Edison's St. Clair and Monroe, Michigan power plants. Midsummer Draft (MS) 34'- 3/4"